Supply of homes priced $2 million or more fell 6 percent from a year earlier, as inventory overall inched up. Luxury home prices rose 3.2 percent year over year to an average of $1.7 million in the third quarter of 2018. This is the lowest growth rate since the fourth quarter of 2016, when prices were up 1.1 percent from a year earlier. This analysis tracks home sales in more than 1,000 cities across the country and defines a home as luxury if it is among the top 5 percent most expensive homes sold in the quarter. The average price for the bottom 95 percent of homes was $343,000, up 3.6 percent in the third quarter compared to a year earlier, but the growth rate was down from 5.1 percent in the second quarter. Luxury homes went under contract after an average of 65 days on market, eight fewer days than in the third quarter of last year, and tied with the second quarter for the fastest pace on record since Redfin began tracking this metric in the first quarter of 2009. The market for non-luxury homes also sped up in the third quarter, with homes spending an average of 49 days on market, nine fewer days than last year and two fewer than in the second quarter. Luxury homes sold fastest in San Jose, California, where they found buyers in an average of 19 days, followed by Ashburn, Virginia (23); Oakland, California (28); Seattle (29); and San Francisco (44). Although the luxury market in these metro areas is moving more quickly than the rest of the country, luxury homes took four to 15 days longer to sell last quarter than in the second quarter in Ashburn as well as Oakland and San Francisco, where the overall market has been slowing for months. San Jose was flat from the quarter before. 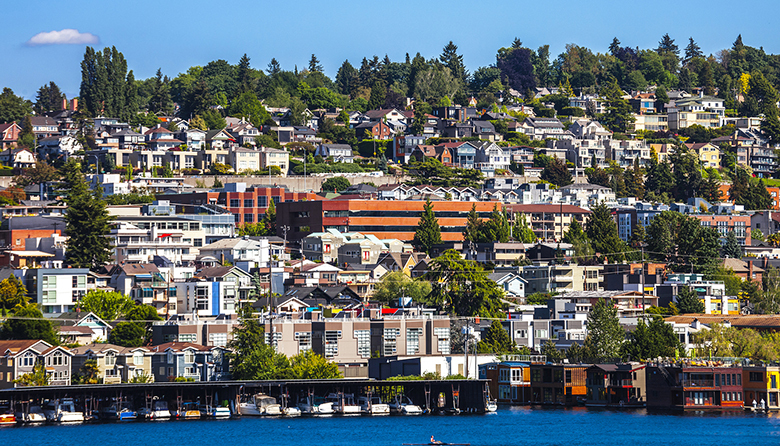 Out of the fastest markets, only Seattle saw sales of luxury homes speed up since last quarter. Florida dominated both the list of biggest gains and the list of the biggest declines. Average luxury price numbers are inherently volatile at the city level, since a few mega-mansion sales can dramatically skew the average in a single quarter. The average price for a luxury home fell the most in Vero Beach, Florida, down 46.1 percent year over year last quarter. During the same period, prices for non-luxury homes in Vero Beach grew 2.7 percent. Prices for high-end properties also fell in St. Petersburg, Florida, (-16.8%); Fort Lauderdale, Florida, (-16.4%); Sarasota, Florida, (-8.4%); and Delray Beach, Florida (-8.3%). For luxury sales and home listing trends, we used a price cutoff of $2 million or higher, because just taking the top 5 percent of the market would result in sale and listing volume trends that were the same as the bottom 95 percent. The figures for inventory and sales are based on a different group of homes than for prices and speed, which was the top 5 percent of homes in each city by price. Sales of homes priced at or above $2 million were up 3.2 percent in the third quarter, the ninth consecutive quarter of sales growth, but the smallest rate of growth since early 2016. The number of homes for sale priced at or above $2 million fell 6.0 percent year over year in the third quarter of 2018 compared to a year earlier. The decline in inventory had inched close to zero in the second quarter, but fell again in the third quarter. Interestingly, inventory of homes priced under $2 million is slightly increasing as of the third quarter, but the luxury market is still seeing a decrease in the number of homes for sale compared to a year earlier. 1. The most expensive home sold in the quarter went for $35.8 million. The oceanfront home is a relatively modest 4,853 square feet and located in a gated community on Riviera Drive in Laguna Beach. 2. Laguna Beach is also the location of the second-most expensive sale in the quarter, coming in at $32.7 million. This Italian-style mansion is nearly 10,000 square feet and just up the street also on an oceanfront lot off Riviera Drive. 3. Did somebody mention Laguna Beach? Yup, the third-most expensive sale was just south of number one and number two, this 10,000 square foot modern mansion just up a rocky hillside from the ocean sold for $32 million. 4. “Canary Cottage” sits on the western edge of the Pebble Beach golf course on 2.2 acres overlooking the 18th hole. It sold for $28 million. 5. Going back to Southern California, the fifth-most expensive home was this 20,800 square foot Beverly Hills mansion that sold for $27 million. 6. The sixth-most expensive home was also in Beverly Hills. According to the listing, this “traditional estate” was “designed by Thomas Proctor to blend 1930’s period details.” It sold for $26.5 million. 7. Just two doors down from number four on the list, the seventh-most expensive home was this 2.7-acre Pebble Beach estate that sold for $25.3 million. 8. Number eight on our list is on Harbor Island in Newport Beach and sports a private dock that “can accommodate up to a 120 foot yacht” and “is configured to moor the world’s most elite watercraft.” It sold for $25 million. 9. The only home in the top ten not in California, number 9 is a corner townhouse in Manhattan’s Greenwich Village that sold for $24.5 million. 10. Number ten is yet another oceanfront estate in southern California. This one is a brand new 9,300 square foot mansion in Dana Point that sold for $23.5 million. Redfin tracks the most expensive five percent of homes sold in more than 1,000 U.S. cities and compares price changes to the bottom 95 percent of homes in those cities. Analysis is based on multiple-listing and county recorder sales data in markets served by Redfin. To determine luxury market winners and losers, we looked at cities with at least 45 luxury sales in the quarter and an average luxury sale price of $1 million or higher. For inventory and sales, Redfin looked at homes priced at or above $2 million that were sold in the third quarter of 2018.